A few weeks ago I got a few questions about what I store in my core vocabulary tubs. I have been meaning to work on this post since then, but I was busy finishing grad. school (YAY!) and then I got sick. So better late than never, right?! books about transportation/ vehicles, things that go, etc. Get a books for free here, here, and here. Talk about how vehicles go. Then practice saying, "GO, train, GO!" or "GO, car, GO!" and have the toy car/ train go. Read books about things that go. Make the sentence "I go." Then run around (the kids will think this is hilarious), then make the sentence "You go." and point to a student and encourage them to run. Practice putting objects in a can/ container. The more noise the object makes as it goes into the container, the better! Give all the students 2-3 options (for example: piano, tambourine, and maraca), have each student say "I want ___". 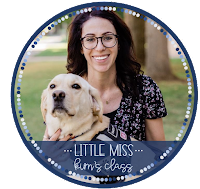 You will need voice output devices and picture cards for kiddos who are non-verbal. Then practice taking turns with the instruments. We will give a kiddo what they requested and then do a 10 second count down. Then we let the kid pick who will have the next turn. Practice looking at the light up toys. I will normally hold the "look" card in one hand and the light up object in the other and say something like "Good! You're LOOKING at the light!" Practice looking at certain objects or people in the classroom. You can give students cues like "Look at Ms. Kim!" "Look at Billy!" "Look at the door!" etc. Pair objects together and ask students if they are the same or different. Students can answer using the core 40 cards, by answering yes/no, shaking their head, signing, etc. You can say, "I'm wearing a ___ (insert color) shirt. Who else is wearing the same color?." Motivating items like stickers, M&Ms, cereal, etc. Open container and show the students the motivating items. Then close the container, hand it to the student and say "open it!" When the student starts to struggle to open it, prompt them to ask for help. Fake fall or sit on the ground and then say "Help me, help me!" and encourage students to help you up. Then students can do the same thing. My kids think this is particularly funny. You can find a free core vocabulary books for go, same, different from my TpT here. 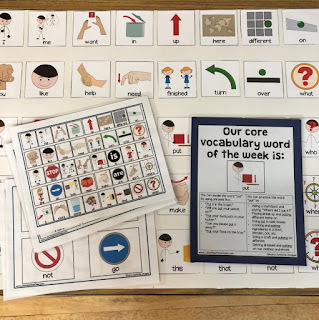 I hope this helps so you have any idea of how I teach core vocabulary in a hands on way. I wanted to put videos of myself teaching the mini-lessons but I'm a little too techy-challenged. 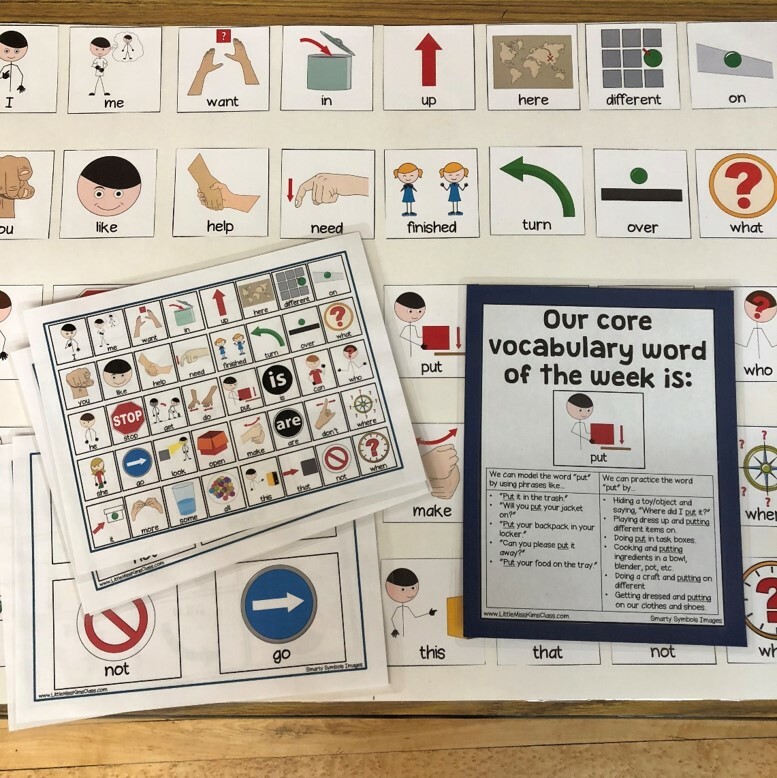 If you want to printables for a large core vocabulary board, personal communication boards, and mini-posters with a TON of implementation ideas, then check out my Core Vocabulary for a Year Bundle here. Click to follow my Facebook for more ideas, freebies and tips! I LOVE this idea! It is such a great way to enforce the vocab board somewhat easily! I will have to start making some of these ASAP! What a good idea! I am going to implement it into my planning for this term. I will adapt it using yes/no visuals as I do not think my new entrants need AAC devices.